I should make it clear that I’ve always insisted on teaching at least one undergrad class every semester, and have done so unfailingly since I returned from my own graduate studies abroad in 1991. The benefits go both ways—young students get to learn from more experienced professors, and senior profs get to know how young people think. With four years of active teaching left before retirement (it’s hard to believe, but I’m getting there), these encounters with some of the country’s brightest young minds will only become more precious, and as with every class I take on, I can only hope that, many years from now, my former students will remember something useful that they picked up from me. I haven’t taught English 11 in ages, so it was with some trepidation that I entered the classroom on our first day a couple of weeks ago, under UP’s new academic calendar. Students don’t realize this, but professors can be just as full of anxiety at the start of the semester as they are. As I scan the roomful of faces, I’m already wondering who will likely give me problems and who will make it worth the effort of preparing for every day’s lesson as if I myself were taking an exam. Thankfully, most of these mutual apprehensions soon retreat as I reassure my students that I know what I’m talking about—and that I won’t scream at them if they don’t—and as I begin to understand what exactly I’m working with, which is always a welcome challenge. This semester, I was glad to discover that my English 11 class of about 30 students was composed of mainly science and engineering majors. You’d think that teaching the humanities to them would pose problems, but I see it as a unique opportunity to lead smart people on an adventure they might have missed out on otherwise. 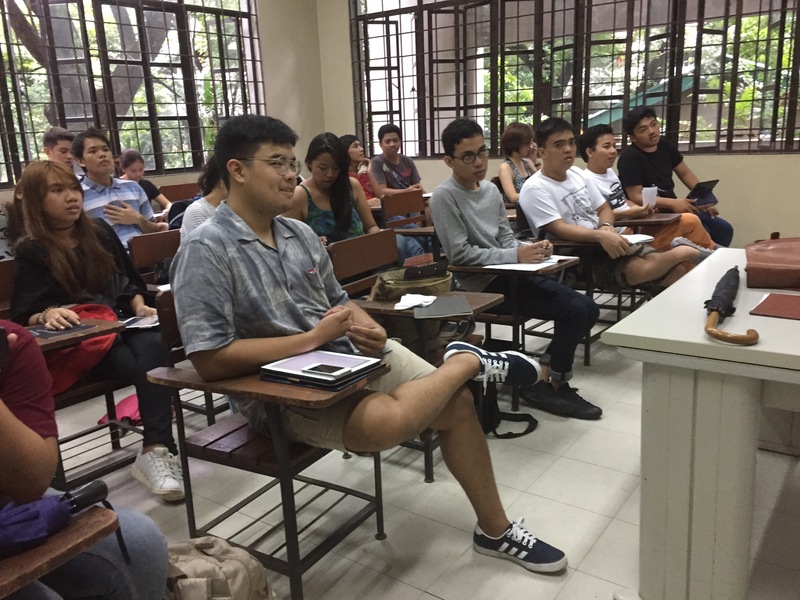 Of course, UP’s General Education program makes sure that our graduates acquire a balanced outlook on life, so my students didn’t really have any choice, but I see my job as making them see Literature as much less an imposed subject than a welcome relief from everything else—in other words, fun. When you disguise labor as discovery, and emphasize incentives over penalties, the students—and you yourself—can feel more relaxed. English 11 is what used to be English 3 in my time—an introduction to literature—and while some teachers see this as a chance to pile on the heavy stuff like The Brothers Karamazov (and I can understand why), I prefer to take the gentler path to literary enlightenment, and begin with things the students know or can apprehend. That way you can lead them to stranger and more intriguing discoveries about the way language works to convey human experience. Last week, for example, one of the first poems we took up in class was “Southbound on the Freeway,” a poem published in 1963 by the American poet May Swenson. We could’ve done something like T. S. Eliot’s “The Wasteland,” but unless you train lay people to look at poetry a certain way—to see it as a puzzle or a riddle to be solved, for example—it’s often very hard for them to get a handle on what some poets do on a high and abstracted level of language and idea, much like the way Picasso’s departure into Cubism (think of his women-figures with their eyes looking this way and their noses pointing that way) can be better appreciated if you first consider what goes into a traditional portrait like the Mona Lisa. “Southbound on the Freeway” reads like a rather simple and even funny poem, in which alien visitors on a spaceship look down at the Earth, and see creatures “made of metal and glass…. They have four eyes. / The two in the back are red. / Sometimes you can see a 5-eyed / one, his red eye turning / on the top of his head.” It doesn’t take much for the student to see that the aliens, hovering above a freeway, have concluded that the cars themselves are Earthlings, and even that some cars—like the “5-eyed” police car—are more special than others. At this point, I ask the class, what’s this poem really about? Is it just about aliens and humans, or about cars on the road? Inevitably, someone spits out the magic word: technology! So what is it about technology that’s so important, I press on, and what does it have to do with our lives? Why, everything, the class exclaims in a chorus—we’d die without our cell phones and iPads! We go into a brief and engaging discussion about what exactly technology means, and whether it has benefited human society—or not. We talk about mechanization, automation, better and easier ways of doing things, products that were invented to improve human life, and inventions that did the opposite. We talk about armaments, and about Eli Whitney’s cotton gin and how it actually helped to encourage more slavery in the American South. I tell them that at some point, later in the semester, I’ll talk to them some more about the legend of Dr. Faust and how it led to the stereotype of the mad scientist, all the way to Dr. Strangelove, Lex Luthor, and Doc Ock. I can see that the class is listening, and I’m happy. I ask them what the real question is that the Swenson poem is posing, and they get it. It’s been a good day in school for Literature and Society. This entry was posted in Art & Culture, Education, Fun, Science & Technology, Writing and tagged diliman, education, literature, poetry, swenson, teaching, UP by penmanila. Bookmark the permalink. Sir, I have a question. Where do i buy the cheapest non-cartridge type of fountain pens?